Week 8 – Its Getting Real! This week the weather is predicted to be rainy and cold in the morning so dress appropriately as the miles continue to climb to 18 miles for the long runners and 9 for the half runners. The route incorporates much of the route of what was the Law Enforcement Half Marathon after it left Melrose and before it moved to Boston, during the few years it started at Lake Quannapowitt. Start 1- This week we start up Main Street towards Ell Pond. Say ‘Hi’ to the Clarence DeMar monument for luck and bear right onto Green Street to a traffic light where you turn left onto the Lynn Fells Parkway. Follow the Lynn Fells all the way to the Saugus entrance to Breakheart on the left. Follow the road up to the upper parking lot at the headquarters building. Look around for the water stop, where we find parking varies every visit. Start 2- All runners, short and long, will head into Breakheart. We’ll be taking the outer loop around Breakheart Reservation. We typically go in the right side and run counterclockwise through the woods, bearing right at the fork in the road at the swimming area. Some runners like to go clockwise, others like to just run the flat side, so feel free to improvise, just don’t cheat yourself out of miles. Make your way back to the headquarters parking lot for a second water stop. Half-Finish- The half runners backtrack the way they came to finish up their 9 mile run, along the Lynn Fells Parkway to the left on Green Street and back onto Main Street to finish at Brueggers. Long 3- The long runners will had back along the Lynn Fells but will turn right onto Main Street in Saugus at the first set of lights. The group will continue on Main as it becomes Farm Street in Wakefield and stop at a water stop on the right at Wakefield High School. Lowell Street will bring you up to Lake Quannapowitt near the Gingerbread Construction Company. Cross to the left side of the road, turn left onto Quannapowitt Way and look for the water stop in the Comverse parking lot. Long 5- After this stop you’ll make your way over to North Ave, choosing to either go along the dirt path or follow the roadway through the parking lot. At North Ave go left and follow it all the way back to Main Street, where the final water stop will be waiting for you at Nick’s Pizza. Long Finish- From here you’re going back to Melrose along Main Street, straight back to Brueggers to finish your 18 miler. Water Stops- Hank is taking the week off, but I’ll be joined by Tom and Audrey at Breakheart. After runners come through there for the second time Tom and Audrey will head over to the drop off area in front of Wakefield High School. When runners make their way through there Tom will move on to Comverse. I’ll meet up with Audrey to help care for the last runners through. After we’re done there I’ll head over to Nick’s, Audrey will check on Tom’s stop, and when they’re done there they’ll meet up with me at Nick’s. That’s the plan. Roll Call! I know quite a few of you are heading down to the cape to run in the Hyannis Marathon or Half so I’m expecting a little lighter of a crowd this week. Let me know if you’re coming so I have the right amount of supplies for the week. Who’s in? Its with regret that I bring the news of the death of Jeff Brogan to our Sunday Long Run group. 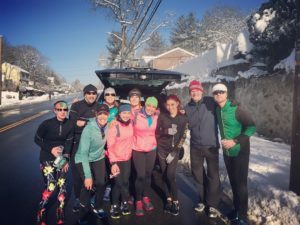 Jeff ran with us off and on over the past few years, specifically through his training for the Baystate Marathon in 2016. There he qualified for Boston running a 3:32:40. He returned to the group this season for his training for this spring’s Boston, running 16 miles with us just this past Sunday. Jeff passed away on Wednesday, experiencing complications with his heart. Jeff Brogan’s Obituary can be viewed here. Our training continues on this week with a 14 mile long run and 7 mile shorter run. Be aware, there is snow in the forecast. While the snow should end before Sunday Morning, be wary of slick sidewalks, narrow roads, and plows. The google map sections are outlined below. 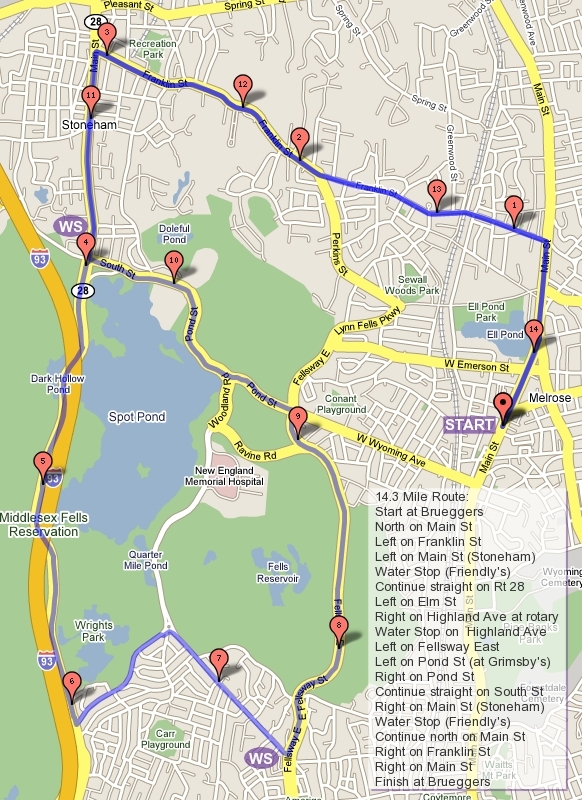 The Start will be similar to last week’s run as we head north, past Ell Pond, continuing on to a left turn on Franklin. Follow Franklin into Stoneham, continuing on all the way to Main Street in Stoneham Square where you’ll turn left. Main Street will bring you towards Spot Pond, hitting a water stop at Friendly’s on Main Street. Half-Finish will leave Friendly’s, crossing to the left side of the road to take an immediate left on South Street which will become Pond Street. Continue past the Stone Zoo, then turning left to stay on Pond Street as it heads down to Grimsby’s. Turn left on the Lynn Fells Parkway, running past Melrose High School and turning right onto Melrose Street and right on Main Street to finish at Brueggers. Long-2 will continue straight after leaving Friendly’s as Main Street becomes the Fellsway West. Follow around the backside of Spot Pond to Elm Street where you turn left. Elm Street will climb up to Highland Ave where you’ll go right and run the length of Highland in Medford, looking for a water stop on the left side of the road near the traffic circle at the intersection at the Fellsway East. Long-3 After the water stop you’ll turn left onto the Fellsway East, running through the hills to Grimsby’s. Turn left onto Pond Street and climb back up to Spot Pond. Turn right at the pond and run past the Stone Zoo to return to Main Street and the water stop at Friendly’s. Long-Finish returns to Brueggers the way you got to Friendly’s originally. Run Main Street in Stoneham back to Stoneham Square where you’ll turn right onto Franklin Street. This will take you back to Main Street in Melrose where you’ll turn right to make your way back to Brueggers. Water Stops at Friendly’s and Highland Ave will be hosted by me, Hank, and Tom. Map Route Sections – New this season, I’m trying to include Google Maps for your phone to help you navigate the route. You can preview each section of the run here. While running, you can start navigating from that section when you’re at the start of that section during the water stop. Note, navigating will need to be started at each stop, the route will not continue on to the next section. Start-1 – We start from Brueggers at 8AM heading North on Main Street, passing Ell Pond and Clarence DeMar as we make our way to a left turn on Franklin Street. Following Franklin up a hill and into Stoneham, pass Stoneham High School and Dunkin Donuts, on to a set of lights where you’ll turn left onto Summer Street. Stay single file on Summer as the road narrows at turns, as you make your way up to and across Main Street in Stoneham to Marble Street. Marble will cross over I-93 into Winchester where it becomes Forest Street. Eugene Drive will be on your left with Water Stop 1. Half-Finish – The half runners will turn back over I-93, back on Marble Street, but at the set of lights turn right at Park Street which becomes North Border Rd. Pass Friendly’s, going straight to Pond Street, past the Stone Zoo, and following Park left after the Zoo down to Grimsby’s. 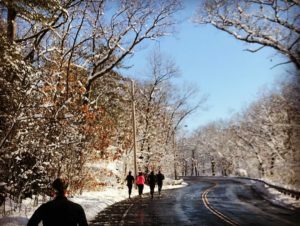 Turn left onto the Lynn Fells Parkway which you’ll follow past Melrose High School, turning right onto Main Street, past Ell Pond, and back to Brueggers for an 8 mile run! Long-2 – Long route runners will leave the first water stop and head down Forest Street. Enjoy the down hill, it gets harder after this. Follow the blue H signs to a left turn onto Highland Ave. Highland will bring you up to Winchester Hospital where you’ll turn left onto Reservoir Road. This is my favorite road of the SLR, travelling along the edge of the Fells as it becomes Hillcrest Parkway… oh yeah there is a hill you’ll have to crest here too. After running along the gas lamp lined road and the big fancy houses, you’ll wind back down to Highland Ave where you’ll turn left. Highland will go through a 5-way intersection straight across to continue on Highland. Here you’ll find why its called Highland as your climb through some more hills to the water stop at the end of the road. Long-3 – The next section of the run will turn right on Main Street, bringing you to a rotary. Enter the rotary and go right onto Main Street where you see a historical marker for Symmes Farm. Following Main there is a subtle fork in the road where you’ll stay right onto Washington Street. Washington will bring you to another 5-way intersection at Mt Vernon Street. Cross Mt Vernon and stay to the right to stay on Washington Street, if you pass Winchester High School you went the wrong way and should be using the navigation map. Washington will bring you to the Gingerbread Construction Company, where you’ll turn right onto Forest Street. Forest will climb back up to the water stop at Eugene Drive. Long-4 – After Eugene, cross over I-93 and turn right at the lights at Park Street. You’ll be on North Border Rd which will bring you to Friendly’s where you’ll turn right. Follow the Fellsway West around the back of Spot Pond. Don’t go down the ramp onto I-93, go over I-93, past the Sheepfold, under I-93, over to Elm Street where you’ll turn left. Elm will bring you up to the rotary at Highland Ave, but don’t go onto Highland, turn left onto Woodland and look for the water stop in the parking lot of Flynn Rink. Long-Finish – From the rink you’ll finish up by running along Woodland Rd up to Pond Street. Turn right on Pond down past Grimsby’s to West Wyoming. Continue straight to Main Street where you turn left and finish up at Brueggers for a solid 16 mile run! Water Stops – There are 4 water stops along this route. The plan is to have Hank at Eugene Drive, Jim at Highland Ave, and Tom at Flynn Rink. There will be Gu available at Eugene Drive. If you’d like more than one Gu along the route, consider donating a bit more to the SLR. Last Week we had a good group of 30+ runners run the old Melrose Half Marathon Route. Great weather helped the runners get a challenging 7 mile or 14 mile training run in to stretch out their mileage. This Week we start our Super Bowl Sunday off tackling a 6.3 mile run for the shorter distance and 12.5 for the longer distance. We’ll start at Brueggers at 8AM, although short runners have the option to call an audible and start at the Dunkin Donuts parking lot on Main Street in Saugus by the Lynn Fells Parkway if they want to include the Breakheart section of the run. The Route begins up Main Street, past Ell Pond and our friend Clarence DeMar’s monument where we’ll run a crossing pattern to the right over to Green Street and turn to the right at the lights onto the Lynn Fells Parkway. The whole group will run the Lynn Fells to the next set of lights and turn left onto Main Street in Saugus. Here the short runners who started will curl left onto Howard Street for a water stop. Short runners who want to run Breakheart will jump into the route at this point, going straight along Main Street towards Wakefield with the long runners. After their water stop the posted short route will return to Melrose along Howard Street and bear onto Green Street to the left to bring them back to the Lynn Fells Parkway where they’ll turn right. Cross Main Street, stay on the Lynn Fells to pass Melrose High School and continue on to Grimsby’s where you’ll turn left onto West Wyoming. At the next set of lights you’ll turn left and rush down Main Street to cross the goal line at Brueggers. Longer runners and those that jumped in will be heading through the hills of Main Street as it turns into Farm Street. Wakefield High School will be on the right where the water boys will run over and hydrate you up. From there you’ll head through the neutral zone between Wakefield High School and the Northeast Metro Tech on your way up to Breakheart. Stay to the right as you head onto the paths, tackling the hills first, then streaking along the flatter side. Make sure you stay to the right as you approach the beach section to complete the loop, popping back out at the Northeast Metro Tech where you entered. Back through the neutral zone down to the water boys. After the water stop run a slant back on to Farm Street if you’re running long. Those that jumped in curl left and head back to where you started. Long runners will turn left at the lights onto Water Street for a lateral over to Wakefield Center. You’ll turn left onto Main Street and from their either march back to the end zone at Brueggers like a Patriot or fly like an Eagle and likely stall in the red zone if you’re so inclined. Water Boys Patriot Fans Jim and Hank, along with Cowboys Fan Tom will try not to fumble your snacks and drinks. While it’s frigid right now, we should get up to the 30s during the run. Don’t forget your $2 for the long run and $1 for the short… there’s a quarterback joke there but there’s only so many football terms you can cram into a running blog. Huddle Up! 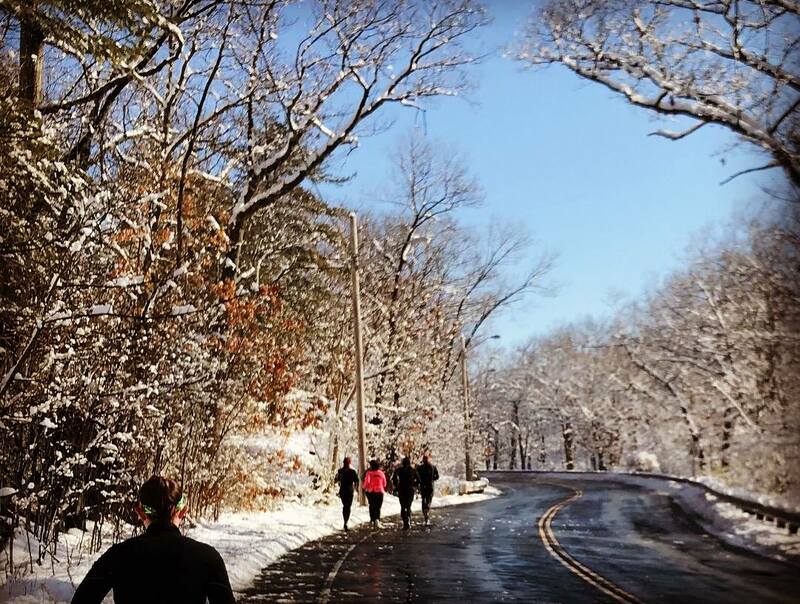 Who’s in for the Super Bowl Sunday Long Run? !